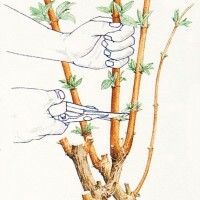 A fast growing climber, Honeysuckle is seen by many as a traditional garden shrub, often seen in gardens growing up a trellis or trailing over walls and fences. 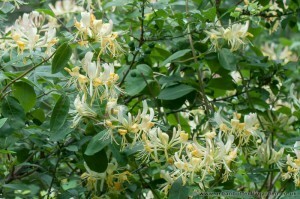 Honeysuckle flowers generally appear from June-August and vary in colour from creamy white, pink, red and light yellow. They are mainly trumpet shaped, and give off an unmistakable sweet scent, most noticeable late evening and at night. 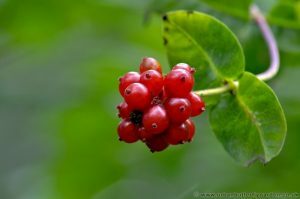 The flowers are followed by bunches of red berries which ripen in Autumn and are often eaten by wild birds during the winter months. Probably the most popular variety of honeysuckle is Lonicera periclymenum (Woodbine) a native species which grows wild in woodlands and hedgerows throughout Europe. It is deciduous (loses leaves in Autumn) with particularly fragrant light yellow flowers flushed with pink/purple and may grow to a height of 5-6m.In Britain wild honeysuckle can sometimes be seen growing up trees in woodland, spreading amongst hedgerows, and other plants using then for support. The leaves are grey – green and oval shaped. Honeysuckles grown specifically for the garden can vary in that, some are deciduous others are evergreen and semi-evergreen. The flowers also can be trumpets or funnel shaped, often forming clusters, although some can occur in pairs depending on the species. 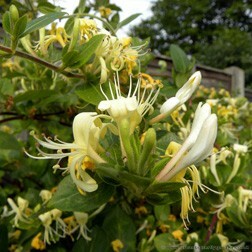 Traditionally scented, some Honeysuckles can also have little or no scent, but make up for this with masses of spectacular flowers. Height: May grow up to 5m if supported. Wild Honeysuckle (Lonicera periclymenum) is the primary food plant for the caterpillar of a rare British woodland Butterfly the White Admiral (Limenitis camilla). Flowering Period: July, August, September. Position: sun or semi shade. 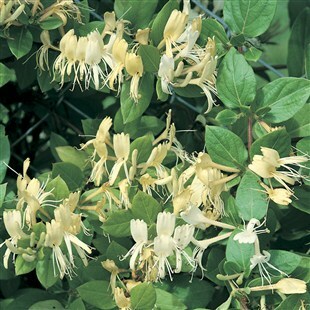 A hardy climber Honeysuckle ‘Belgica’ has sweet scented flowers that begin white and gradually turn yellow with rich red streaks. Early Dutch Honeysuckles usually flower early summer and often follow up with a second flush of blooms in late summer, September to October. The glassy red berries that are loved by garden birds. Lonicera Japonica Halliana is an evergreen Honeysuckle that produces masses of creamy white and yellow very fragrant flowers, all spring and summer. 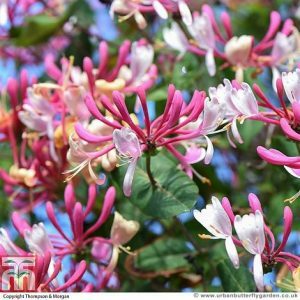 Also known as Japanese Honeysuckle, Honeysuckle ‘Halliana’ is a vigorous climber and will rapidly make it’s way up a trellis or wall, plant in the garden near windows or doors to fully appreciate the wonderful scent. 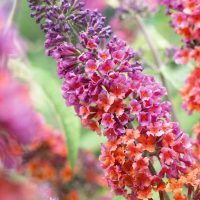 A robust climber with long, red and orange trumpet-shaped flowers that continue to bloom from July through to September. 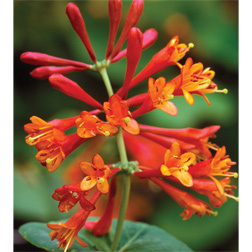 Although unscented, Honeysuckle ‘Dropmore Scarlet’ makes up for this with masses of colourful flowers, vigorous growth and semi-evergreen blue-green foliage, ideal for hiding an unsightly area of the garden like a wall or fence, or trailed through a large mature tree. Soil Type: In fertile, moist, free draining soil. Height and Spread: 4m (13′), 2m (7′).